Situated in the heart of the historic university city of Oxford, this beautiful 17th-century coaching-inn looks over the Examination Halls and Magdalen Tower. 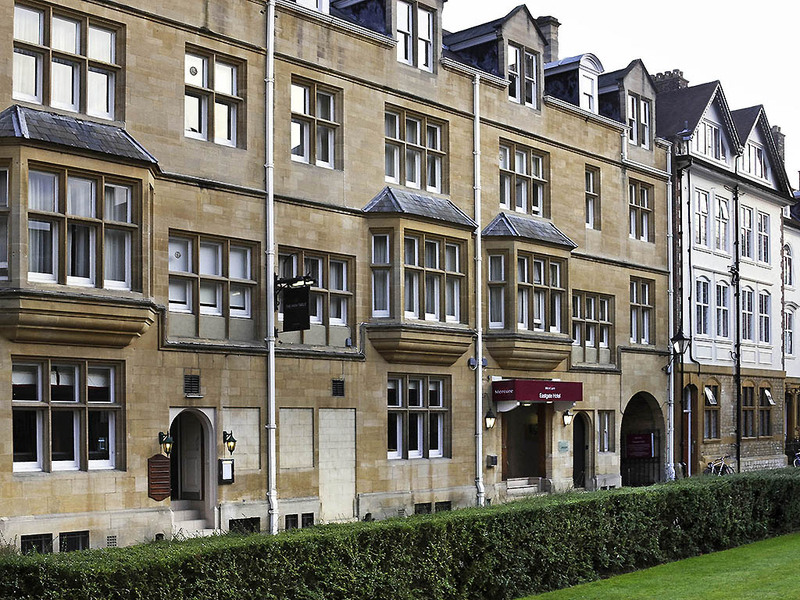 The convenient central location allows guests to easily discover Oxford's most iconic landmarks. City sightseeing tours are available in the area, making this a great base for guests who want to explore. The hotel offers modern, comfortable rooms which are perfectly equipped to accommodate individuals, couples and families. The hotel boasts a choice of rooms including classic and privilege options. Those looking for an extra special trip should consider the deluxe suite, which overlooks Oxford High Street and offers luxurious extras including a coffee machine and robe. Eat, Drink & unwind morning, noon & night at the Keepers Kitchen & Bar. Soak up the atmosphere and experience a twist on traditional British and European cuisine with an imaginative menu that includes honey sourced locally from the Cotswolds. Very small overpriced room with a terrible view of a brick wall and a loud extractor fan outside the window. Bathroom window wouldn't close and heating was on full without us able to override it. Reception staff were pretty nonchalant with guests.. In total contrast the breakfast staff were great. Reception staff also signed us up to a mailing list without our consent against gdpr rules. Overall great. Though, no decaf tea bags in the room and the poached egg breakfast was unacceptable. Served on cold, soggy unbuttered toast and eggs rock hard and saturated in vinegar yuck! Great hotel in Oxford, Location ist good, rooms are very nice and staff ist very good. Stayed for seven nights, but housekeeping didn’t replace toiletries (apart from shampoo/bath gel) even when specific requests were made (on more than 2 occasions) with the front desk. Was also assigned a “Privilege” room (102) that was right in front of the staircase swing door and next to the housekeeping supply room, which meant constant noise from guests and staff coming and going. Even though I had put in a request for a quiet room when booking. Will be staying at the Malmaison and Courtyard Marriott in future. Excellent location a comfortable base for our two night stay. Car parking was available although there had been issues on comfirming availability prior to our visit. Breakfast choices were good and the staff helpful but very busy. It needed a supervisor to ensure there was enough cutlery at tables and that food choices were kept topped up. We had to ask for various things. The room instruction folder should have been visible and directions for turning on the heating included. Service (all aspects from reservation through checkout), lounge facilities, breakfast were all excellent. Location is also excellent, with easy access to town center, colleges, buses to airport/london etc. The only issue was with the size of the room. The room that I had was extremely small. I understand that other rooms are larger, but they were all taken and I did not see any of them. Very pleasant stay and helpful staff. Very comfortable and enjoyable. Only negative aspect was the noise of a generator/air conditioning unit throughout the night outside in the yard below by window. Brief but good- we had to move rooms when we returned from night out as the radiator had broken and the room was overheating. Reception staff were very helpful and waived the parking charge. Room moved to was not as nice as original room so if we were staying for longer would have preferred a nicer room- ie small/attic/no mirror in main room/etc. Everything has been perfect from check in to check out. After a really good night sleep we had a wonderful breakfast we were than ready to explore all the beauty of this charming city. A special thanks to Alex at reception. Really Comfortable Bed and Excellent Breakfast; Efficient Friendly staff - What Else Matters? True not a huge room (I note some guests state rooms are small) but a very comfortable one and such a comfortable bed. Our room was at the back of the hotel and gave us a very pleasant view of rooftops and a glimpse of the church beyond - easy to ignore the car park below and we were nor disturbed at all by any activity there. Reception and restaurant staff were all very pleasant, knowledgeable and efficient. True it took a minute or two for hot water to flow in the shower, but that wasn't a problem at all and it was a nice big shower head. Options which we enjoyed at breakfast included smoked salmon, fresh fruit and figs and a good muesli which wasn't sweetened - can be hard to find in hotels. Bit disappointed by the dinner menu as it was fairly standard pub grub. But the great central location meant just a short walk to a good range of restaurants. A very nice stay with extremely kind and helpful staff! The room was nice. The reception staff were very kind and helpful, and special mention should be made of your restaurant manager, Nella (from Kalkidiki in Greece): she was very nice and helpful and the service could not have been better! We enjoyed a very pleasant stay at the Eastgate hotel in Oxford again. We have stayed here for a number of years and again had a very pleasant stay. We upgraded to a Privilege Room which was most welcome as some of the rooms are pretty small. The service throughout was good - attentive without being overbearing, we had lunch and breakfast a couple of times which were all very good. the bugbear was finding out on arrival that overnight parking was £20 per night - this was the first time this had been charged for us and wasn't mentioned on the website when booking ! This is a lovely hotel with cheerful and very helpful staff. The hotel is full of character, having our cooked breakfast made to order was a delight rather than have to use a buffet which is most common these days, the only problem with this was that the bacon had obviously been pre-cooked and had been under a heat lamp for a considerable time and was very dry and chewy. Understandably due to the age of the building there are no lifts and we were on the 3rd floor, the staff offered us assistance with our luggage if needed. The hotel is well located within walking distance of the main sites of the university, overall we had a lovely time. The location was great, the staff were friendly, however the quality of the rooms let your establishment down massively. For £175 per night the first room was tiny and tucked away in the basement with a view of the carpark and a window that people used to park bicycles against. At 6ft tall (not a giant) the shower head came to my chin! To top this off the tap was loose and then the AC was making such a noise I could not sleep (neither could my wife). They did move me rooms, an upgrade, and a reduction in rate. The new room was to a higher standard and size however I do not feel it commanded the fee in comparison to other oxford hotels. It felt everything was done on the cheap. Sad to say this tarnished what was a great weekend. Stayed for one night but felt very welcome by the staff that also helped quickly. The room I had was singular, I never stayed in such a hotel room. Not in a negative way, just different.